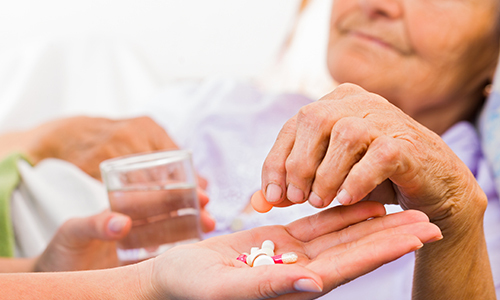 Supporting an aging loved one usually requires management of various medications in accordance with an in-home care plan. This is no small task: juggling the refilling and administration of medications from different doctors, meant to be taken at different times, can be a part time job in and of itself. At Your Service can help. Our medication reminders service streamlines the entire pill process, making it less stressful and more comfortable for our clients and their families. Why are Medication Reminders Important? The sad reality is that millions of elderly patients are victims of drug mix-ups every year. In the worst cases, those mix-ups can be fatal. Even less severe cases can result in frightening symptoms, such as light-headedness and fatigue. Because aging often results in multiple medical ailments, more medicines will be necessary, thus increasing the chance of a mix-up. As we age, our bodies may become more sensitive to what we put in it, so medications taken by seniors may interact negatively with other substances they consume, including over-the-counter drugs and common foods like coffee, alcohol, and herbal supplements. While it may seem inevitable to make a mistake with medicine administration at some point, the truth is that with a simple plan and a little guidance in implementing it, the process can feel far more manageable. What Medication Reminder Services are Available? The medicine reminder assistance offered by At Your Service relieves families of our clients of the many, often-confusing details of a medicine plan. It also frees up more time for them to provide support in other crucial ways, such as by administering drugs, attending doctor’s appointments, and otherwise caring for their loved one. At Your Service understands the sensitive and vital nature of drugs and healthcare, which is why our medicine reminder services start and end with the unique needs of each of our clients. Our staff consists of highly-trained Wisconsin Certified Nursing Assistants (CNAs) who understand what it takes to be a trustworthy and dependable resource for those receiving in-home care and their families. Supporting numerous satisfied families across Waukesha and Oconomowoc County, At Your Service has built reputation for being friendly, responsive, and skilled, no matter what circumstance should arise. To learn more about how we can help you or your loved one with medicine reminders, and to get started with any of our in-home care services, contact us today by filling out our online form or calling 262-354-3700.